Probably introduced during the late 1880s, the German Wolf Jahn Precision Instrument and Clockmaker's "Miller & Jig Driller" was produced in many forms and originally marketed in Great Britain by George Adams of London. It's obvious usefulness and ease of operation led other companies to copy the design, notably Boley, Leinen & Boley & Leinen as their Models "80", "80a" and "BFL". Developed copies of later versions (the unit was subjected to a slow but steady development of its features and mass) were also made in Britain and badged variously as Ultra, Excel, Sigma-Jones and BCA. Amazingly, its indirect successor, the BCA Mk. 3, is still available today in 2009. Like many makers of precision machine tools in both Europe and America (Lorch, Boley, Levin, Bottum, American Watch Tool Company, B.C.Ames, Hjorth, Potter, Pratt & Whitney, Rivett, Wade, Waltham Machine Works, Wade, Pratt & Whitney, Rivett, Cataract, Hardinge, Elgin, etc. Wolf Jahn made a series of millers which used parts adapted from their range of smaller lathes. Although useful, especially when adapted from horizontal to vertical, these machines were not really versatile enough for the range of work typically encountered by watch, clock and instrument makers so consequently, to meet this demand, the company developed two separate, distinctive patterns of machine, the "Swan-neck" Type A and the very much more expensive "Pillar" Type B. Each miller used a lathe-like collet headstock mounted on a vertical slide and fitted with screw-operated fine down-feed as well as a lever-operated drilling action; both had spindles manufactured from hardened and ground cast steel and running in bearing of the same material; speeds of up to 5000 rpm were allowed but, as there was no provision to mount a motor on the miller itself, the round-rope drive had to be arranged to approach from the side in such a manner that it could accommodate the rise and fall of the head. Although the illustration does not show it, the Type A was split along its base so that a suitable distance piece could be inserted to raise the head - and so increase the standard clearance of 6" between the spindle nose and table. What made the machines uniquely useful was the inclusion of a permanently-mounted, T-slotted, 4.75" diameter rotary table driven by a worn and wheel arrangement - the wheel part of the gear being left exposed around the edge. 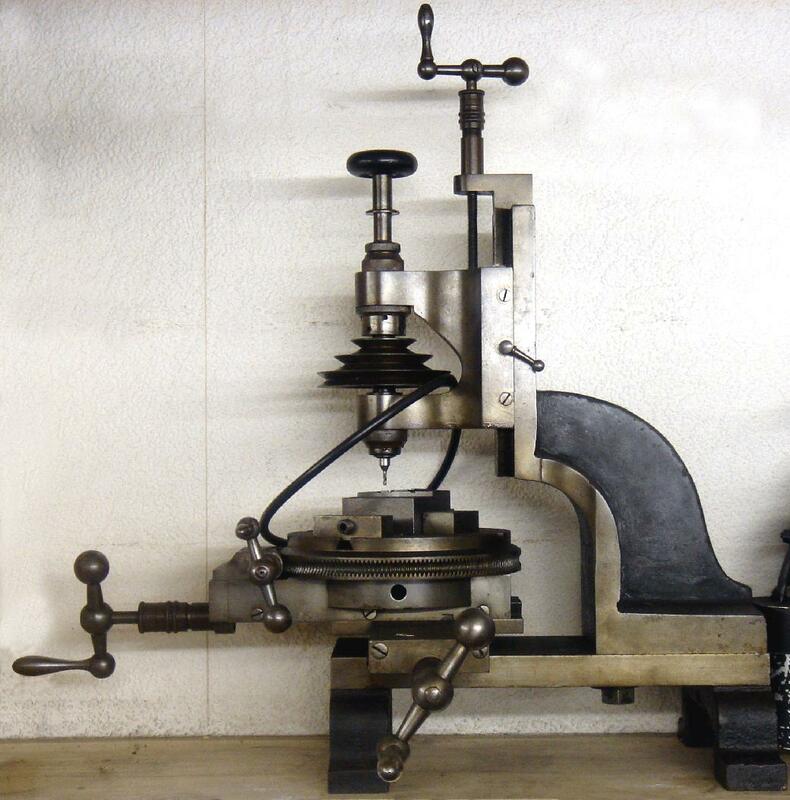 A considerably larger and altered machine, the Type B had a "headstock" that was taller with an additional 17/32" of travel - it was also able to accept a 10 mm collet, 2 mm larger than the Type A, and had a maximum clearance beneath the spindle nose of 13". Two small jockey pulleys were also fitted to a horizontal shaft at the side of the headstock to guide and align the drive rope as the head - which could be slid up and down its mounting column - travelled to the extremes of its possible locations. 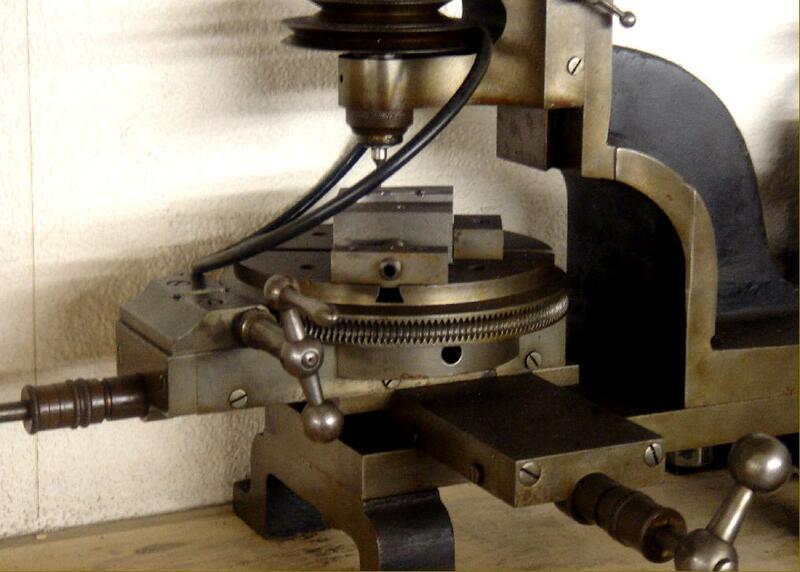 The diameter of the rotary table was increased to 7" and the compound table beneath it made correspondingly larger. Just two types of free-running ball-bearing countershaft were offered: the 'fast-and-loose' pulley equipped "H" and the plain "F" - both designed to run from fractional horse-power motors. The Type A miller weighed 45 lbs and cost, in 1931, £13 - whist the Type B tipped the scales at some 40% more and was £21. Often found without any maker's identification, it is likely that, like watchmakers' lathes, they were re-badged (or even copied) and sold by larger dealers such as George Adams of London either under their own brand or anonymously. Lower down this page can be seen one of the Wolf Jahn's successors, manufactured in England as the BCA - a machine developed though several versions in the including the Excel Model "0" and "Ultra". All were copies of the pre-WW2 Leinen (and Boley & Leinen) Type BFL, themselves copied from the G.Boley Models 80 and 80a from the 1920s (G.Boley and Boley & Leinen were entirely separate companies). These machines were all much more robust designs than the early Wolf Jahn types and, though the BFL and the BCA both lost the quick-action drilling facility, each was fitted with a useful swivelling head. The BCA was further developed and the final version, the much heavier and more rigid Mk. 3 was still available as late as 2009..
Wolf Jahn Type WJA Vertical Milling and Drilling Machine - a model with both lever and screw down-feed to the head -very similar to the Boley Type FM80, also built in the City of Frankfurt, Germany. Wolf, Jahn Type B Vertical Milling and Drilling Machine. This model had a longer head with a greater travel (317/32") than the Type A and was able to accept 10 mm collets. It order to compensate for the greater range of vertical movement permitted by the head's pillar mounting - and hence the need to guide and align the drive rope - two small jockey pulleys were fitted to a horizontal shaft at the side of the head. The spiritual if not literal successor to the Wolf,Jahn was this much larger and more robust BCA Mk 1 - probably first produced in the early years of WW2 as the "Ultra". 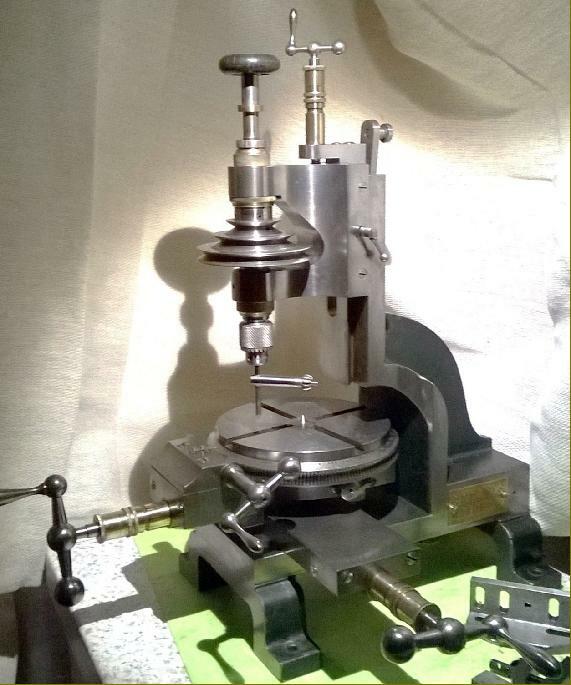 It is still a popular and very useful machine capable of making light of many otherwise difficult machining operations. Further details of the BCA and other derivatives can be found here. A high-quality vertical miller, jig-borer and jig-driller by an unknown maker - but advertised in the Melhuish catalogue of 1898 and quite possibly by Wolf Jahn. The machine stood 22.5 inches tall, with a base 22 inches long and 11 inches wide; The nose of the 3/4-inch diameter, tool-steel spindle stood 3.5 inches clear of the rotary table and ran in hardened double- cone bearings 13/16-inches in diameter; it was bored clear through and accepted collets tightened by a draw tube, the handwheels of which can be seen in position. Longitudinal travel of the table was 6.75 inches and the traverse movement 5.5 inches; the machine weighed approximately 165 lbs and cost £30 - as much at the time as a fully specified, English-manufactured five-inch centre height Britannia No. 16 backgeared and screwcutting lathe on a treadle stand. Model E Wolf Jahn precision miller with backgear headstock and power longitudinal feed. This machine resembles many others by similar makers of very high-quality machine tools - Mikron, Pratt & Whitney, Rivett, Waltham, Ames, etc. 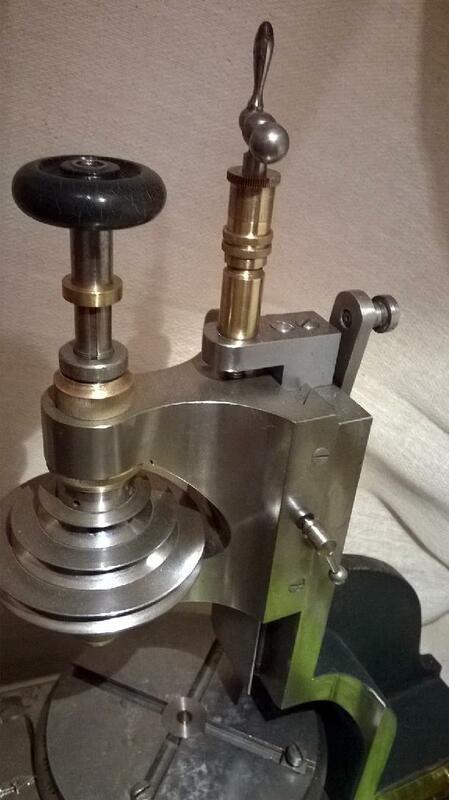 - being based upon a headstock adapted from a lathe. In this case the head has been arranged to slide up and down a vertical slide but is, in all other respects, similar to the simpler horizontal machines shown here.